We went on an amazing trip to the Galapagos last month. We saw and did so much, I knew I had to keep a journal to remember everything. Some of my fellow travelers asked me to scan it, so I figured why not share with the internet too? (Click for an interactive version). I love to keep a paper journal but it’s been difficult to find the time in the last few years, so I relished the chance to spend a computer-less vacation with pens and paper. The notebook is made by Michael Roger and the markers are Staedtler Triplus Fineliners (both found at the Brown Bookstore during a quick lunchtime shopping spree). I have very little drawing experience and sometimes I feel held back by a perfectionism which I have little chance of achieving, so I ONLY brought pens, no pencils. If I made a mistake, I made a mistake – it was freeing and fun. I thought the journal might be interesting to anyone considering a trip to the Galapagos who wants to get an idea of what it’s like. You have to visit the islands with a guide, so an organized trip is the best way to go. Our trip was organized by Beyond Your Backyard Adventures, a small trip geared towards people who really want to get out and see everything (no whiners!) We had an amazing experience and are still working through thousands of photos. I come from a long line of men who write in all caps I used to be able to write in lowercase but it’s been so long, I’m usually typing, it’s even messier. 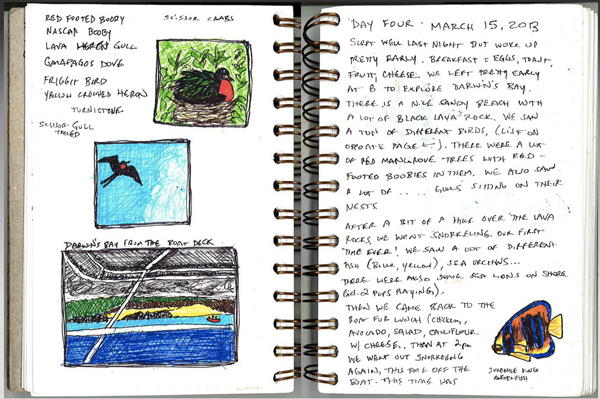 I’d never considered the Galapagos as a travel destination, but your journal and story have gotten me interested. Galapagos Travel is my dream and i want to there there some day before i die.Such a dream destination.Thanks for your post its very interesting.